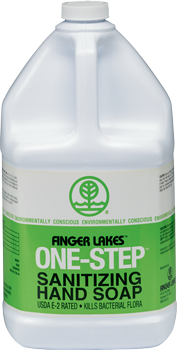 Finger Lakes One-Step™ is a USDA E-2 rated hand soap. A mild blend of emollients, conditioners, and sanitizers make it possible to wash and sanitize in just one simple step. 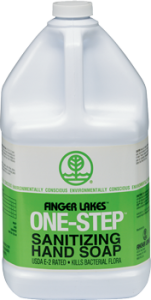 One-Step™ protects the acid mantle of normal skin while effectively reducing the bacteria flora. 1. Wet hands and arms, and apply One-Step. 3. Scrub thoroughly for several minutes. 4. Rinse completely, and dry with a clean cloth or disposable towel.